There are some very talented writers who contribute to the Jewish Independent, so it’s not surprising that many of them have been published elsewhere. Here are brief reviews of six books that feature contributions from, or are authored by, freelancers who have written for the JI at some point. 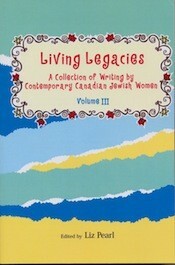 Living Legacies: A Collection of Writing by Contemporary Canadian Jewish Women, Volume 3 (PK Press, 2011), edited by Liz Pearl, comprises essays from more than 35 women, including at least two who have contributed to the JI – Shoshana Litman (Victoria) and Ricki Segal (Winnipeg) – as well as three other British Columbians: Shelley Halpern Evans, Dale Adams Segal and Helen Waldstein Wilkes. In this most recent volume, Pearl has once again collected from women across the country stories that create connections, both spiritual and human. Living Legacies Vol. III was released in 2011. In writing about how she’s been composing prayers all her life, despite her non-religious upbringing, Dale Adams Segal notes that she has “paddl[ed] down many rivers of growing up: of being married and divorced and married again, of birthing children and witnessing the birth of a granddaughter, of finding those whom I would love and losing those whom I have loved…. I share with you that this practice of writing prayer has restored me to life again and again….” And Ricki Segal pays tribute to her mother, who at the time of writing was suffering from dementia, in sharing some of what she has learned from her mother about love, attentiveness, tenacity, forgiveness and other important facets of life. 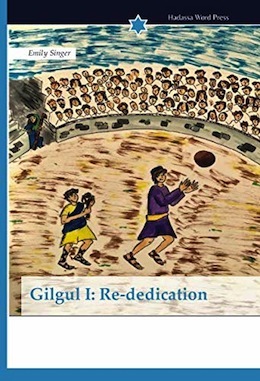 Role models would describe all of the contributors to this and previous volumes of Living Legacies – and this fact offers reassurance that there are many more women (men and children) who would also fit that bill. For Canada’s Jews, Robinson has amassed almost everyone who is currently attempting to continue Rome’s and Arnold’s legacy. Local contributors are Jewish Historical Society of British Columbia historian emeritus Cyril Leonoff, who co-wrote the chapter on Vancouver with me; University of British Columbia Prof. Alex Hart, who contributed an extensive essay on Jews in English literature; and UBC Prof. Richard Menkis, who wrote two chapters, a revised version of a previous article on Reform Judaism in Canada, and a comprehensive look at Conservative Judaism, as well as Reconstructionism and Renewal. In the preface, Robinson notes that Canada’s Jews “will be of interest to scholars, students and readers of Canadian and Jewish studies,” however, the essays are, on the whole, very accessible and most people will find something to engage them. 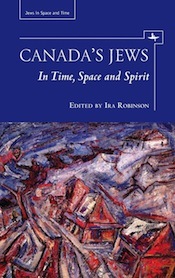 The book has three parts: the first spans the history of Canadian Jews from the mid-1700s to after the Second World War; the second looks at contemporary Canada, beginning with a couple of chapters on general demographics and politics, followed by chapters on Jewish communities across the country; and the third comprises chapters on Judaism, Yiddish, literature and art, with the volume’s concluding chapter being a detailed inventory of the state of Jewish studies in Canada and recommendations for how the field might expand. Canada’s Jews is full of factoids that can be gleaned on a quick reading. For example, “While almost all Canadian Jews in 1945 were Ashkenazi, today close to 20% have Sephardi roots” (Franklin Bialystock); Regina’s Jewish population in 2001 was 720, “about the same as it had been since 1951” (Debby Shoctor); and 2005 calculations show the average household size for the Jewish community as a whole in Greater Montreal to be 3.46, compared to that of the Satmar/Belz/Skver, 5.69; Lubavitch, 5.45; and Tosh, 6.37 (William Shaffir). Because of how data are collected and the fact that such essay collections take a long time to put together, hunters for current statistics will be frustrated, as many of the survey and census figures are almost 10 or more years old. As well, the chapters on specific cities’ communities are quite brief in some cases and, while they provide a general overview and raise some issues for future research most – including the chapter I co-wrote – do not delve into any analysis, for example, of issues such as the effects of immigration on communal participation and/or fundraising. Perhaps the situation in small communities is similar – limited availability of information and little previous analytical work on which to build. These small criticisms aside, the volume will contribute much to readers’ knowledge of Jews in Canada, and there are several in-depth analyses in the collection, including a couple of chapters that provide fascinating reading for anyone interested in the evolution of the mainstream Jewish community’s structure on a national level. 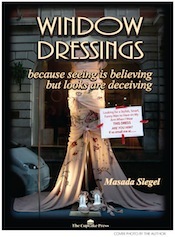 On the fiction front, readers of chick lit will appreciate Masada Siegel’s first novel, Window Dressings (Cupcake Press, 2012). It begins with the main character, Skye Silver, attempting – and failing – to manouevre her body into a position that her boyfriend Gregg wants her to try from the Palmasutra, a mobile operating system version of the Kamasutra. The trouble in bed is but one of the problems this couple is having in their soon-to-be over three-year relationship. Religion (Skye is Jewish, Gregg is Protestant), lack of communication and insecurity, among other things, lead to the betrayal that sends Skye into singlehood. 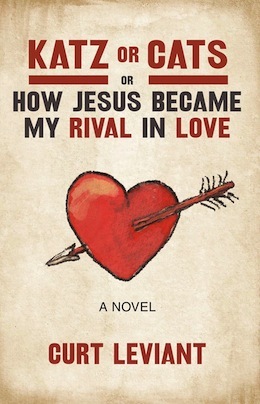 Readers of chick lit will appreciate Masada Siegel’s first novel. Despite a poor body image, sadness over her break-up and very high standards for the outward beauty of possible mates, Skye manages to find many suitors, and much of Window Dressings is about what happens on those dates. She is supported by two besties: Josh, a writer/editor, with whom “mutual attraction had turned into a strong friendship”; and Karen, an international model. While Skye is getting used to her new status and trying to meet “hot neighbor boy” – both a real character and Skye’s ideal man – she loses her job at Xtremedream advertising. Halfheartedly looking for a new job, she takes on some freelance work, falling back on the journalism degree she got in addition to her master’s in business admin. With relative ease, it seems, she lands a job at the New York Times and, dream job in hand, life gets even better for Skye. Olga Godim’s first novel explores mother-daughter relationships. Meanwhile, Sonya is steeling herself to kick out her drunk of a husband, Alexei, as she can no longer afford to support him, herself and their teenage daughter, Ksenya, on what she earns from working two jobs. The Russian family arrived in Canada two years earlier from Israel, where Sonya had been a dancer and a dance instructor, and they now live in Vancouver, where Alexei’s supposed musical genius is as underappreciated as it was in Israel. Sonya not only has to deal with an alcoholic partner and trying to scrape out a living, but with her daughter’s understandable frustrations. The book follows Amanda’s search for her other daughter; along the way, she also opens herself up to life for the first time since her husband died. It also follows Sonya’s struggles with Ksenya, and their rapprochement. Godim writes authentic dialogue, and captures the intricacies of relationships, mainly that between mother-daughter. Most interesting, however, is the view of Judaism from a Russian perspective, not only how one self-identifies culturally, religiously or otherwise, but the prevalent antisemitism. 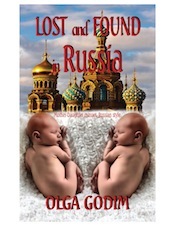 The fairytale ending is over the top, and there are a few odd scenes that could have been replaced with more development of the main characters, but the writing style and especially the Sonya-Ksenya relationship, make Lost and Found in Russia a good read. 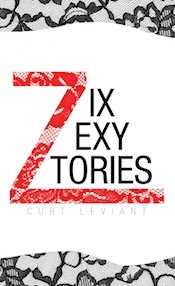 It’s hard to know what to think about Curt Leviant’s Zix Zexy Stories (Texas Tech University Press, 2012). Leviant is an excellent writer, he’s knowledgeable about literature, Yiddish and Judaism, among other topics, and he has what to say. But he has a weakness, or made a poor choice. 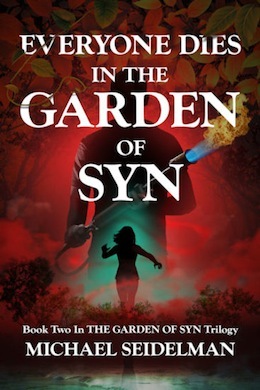 In pretty much every one of the seven (not zix) stories in this collection, he features a young, blond, big-breasted, non-Jewish, beautiful, dumb woman who admires, lusts after or is married to an older, professorial/rabbinical Jewish man. Perhaps this is an intentional attempt to link the stories – with the trope of the shiksa goddess – but, if so, it doesn’t work. Better the Franz Kafka connection that ties at least four of the stories. Curt Leviant’s short stories are thought-provoking. Throughout the collection, such thought-provoking passages appear. As well, Leviant is a strong storyteller. In “From Golden Necklace,” about an architect who travels to Italy to see a special collection of art, the tension is palpable when the architect sees the necklace his mother – who, along with his father, was killed in the Holocaust – on the woman escorting him around the palazzo. As another example, ignoring the object of Shmulik Gafni’s supposed affections (a shiksa), Leviant masterfully exhibits the ability of words to both accuse and acquit someone: none of the facts substantiates the rumor that Gafni is an adulterer, yet that very fact fuels it. All of the stories have something to recommend them. Mark Binder’s The Brothers Schlemiel is a good story very well told. 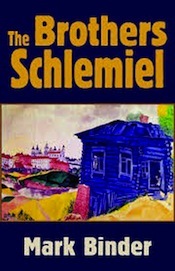 On the inside cover, The Brothers Schlemiel by Mark Binder (Light Publications, 2013) is described as “… a novel of Chelm … being the reasonably complete adventures of Abraham and Adam Schlemiel, identical twins, born in the village of fools and confused from birth.” As most readers know, from Chelm – from dim-wittedness and confusion – comes great wisdom and clarity, along with, of course, much humor. Binder has created characters with whom we empathize, not just Adam and Abraham, or Abraham and Adam, who can’t even tell themselves apart at times, but their parents, sister and the other villagers. 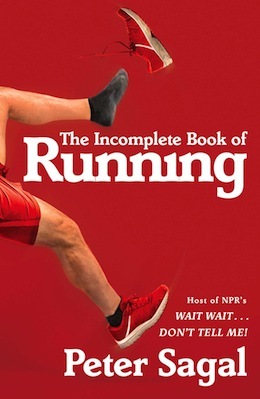 He ably manages some fine balances: writing about silliness without the story becoming stupid, and evoking sentimentality while not becoming saccharine. There are parts of The Brothers Schlemiel that could even be called scary – encounters with Russian soldiers and gun-wielding robbers. 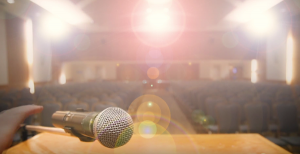 As well, through the vehicles of comedy and fantasy, The Brothers Schlemiel touches on many serious topics, from poverty to racism, to ethics in business, to whom people choose to be, and more. At the end of the day, however, The Brothers Schlemiel is just a good story very well told.